I really wanted to get the shows into the spotlight. Now you’ll always find the latest show on the front page, above the fold. This isn’t just a cosmetic overhaul, I decided to make some tough choices, like changing my link structure to a much simpler format. SO… if you’ve got links out there pointing here, they may not reach their final destination. That’s OK. We’ll rebuild together. As with every revamp of the site – at least it’s been my experience – things will have broken, and may not work like before. I’ll be tinkering, discovering, and patching as I go. If you run into anything drastic, pitch me an email and let me know. Some features are drifting into the shadows, while others are lurching forward and begging for some love. It will all balance out as we get back into the swing together. I’m adding an image for when I tear it all apart next time and people wonder, what did it look like before? Love it, and can’t wait to hear a new ep! I have you in my RSS reader and was just waiting for you to post again. Good to hear from you. 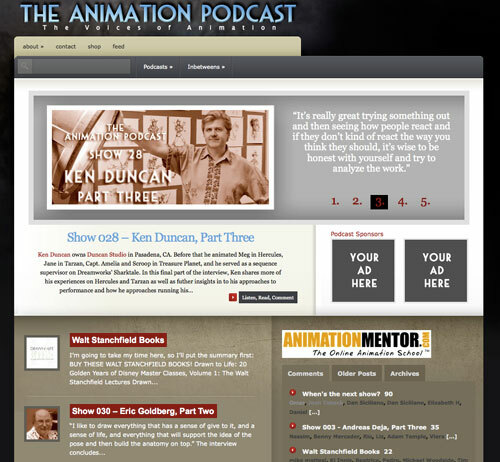 Changes look good and I’m looking forward to another episode of The Animation Podcast. I find it very inspirational. You should put an image up of what it looked like before too…..if you still have one! D’oh! I think I listened to the James Baxter episode about 10 times, and I’m learning something everytime, haha. So keep up the great work, it’s very much appreciated! Wooo, now there’s news 😀 I think the new design looks really good and should certainly have the desired effect. I am looking forward to new episodes. They are such a good listen, especially while drawing or painting. Quite motivational, actually! So fresh and so clean! Very much looking forward to new interviews. What font is that you’re using? It’s absolutely perfect! Glad to see your alive Clay. Looking forward to a new show. I’ve gone through all the oldies about 4 times now. I’ve tried other animation podcasts but they’re not the same. Great job on the site update. Hi everyone. Thanks for the comments. I’m glad you like it. It’s also very good to know I haven’t lost you in the last year. Matt C – Listen to whatever it takes to get you animating! I’m happy to help. You know, I don’t have an image of the old design and Google cache has already updated. DOH! No worries. Never look back! Always to the present! Thomas – I don’t know how cleaning animation curves is “brainless” but I’m glad you enjoy the shows. About Rhino: thanks for mentioning it. I had a fantastic team of animators to bring him to life. Jim – still love my WordPress! Milton – which font would that be? Robert – Aw shucks! Now THAT makes me want to make more. I will, I will! looking good. I think it looks a bit clearer now. Anyway, I have been listening to the Ken Duncan interviews a lot lately and found what he had to say fascinating. Ken Duncan is not one of those animation superstars like Goldberg, Keane or Baxter but he had a lot of very interesting things to say. its been mentioned before but you should really get someone to interview you or (since youre obviously a very humble fellow maybe asking someone to interview you for your own podcast would feel awkward) just get together with other animators who worked on it and just do a great long david icke scale talk about everything. I (we) would love it. (or is there a legal problem with talking about new features like bolt?) I know its asking a lot but you are so good at this! hehe. well! if you feel like it sometime. thanks for everything! terrific! have mentioned some helpful information in there.